Tropes first documented after the invention of radio (1890s) and before the emergence of television (1940s). 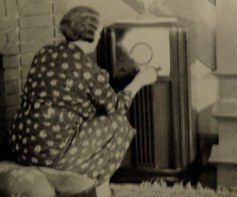 Radio and Cinema provided two new media, for the first time in millennia, and originated many TV tropes. This is also the time of the first Super Heroes. For future reference: TV, as we generally know it, was invented in 1928, but regular broadcasts didn't start until 1936 in the U.K. and Nazi Germany and 1939 in the U.S. and U.S.S.R.
Adorably Precocious Child: Edogawa Rampo's [1894-1965] detective novels. Alertness Blink: Pick an early-20th Century cartoon. Steamboat Willie (1928) is a good starting point. Animal Talk: The Wonderful Adventures of Nils and The Further Adventures of Nils, Selma Lagerlöf, 1906 and 1907. Banana Peel: Early 20th-century pop culture. Broke Episode: A lot of films and literature made during the Great Depression featured impoverished protagonists. Contractual Purity: Shirley Temple drinking. *gasp* She was in her twenties. Cyberpunk: Metropolis 1927, by Fritz Lang. Dawson Casting: 16-year-old Judy Garland as 11-year-old Dorothy in The Wizard of Oz, 1939. Death in the Clouds: The Trope Namer is the Agatha Christie novel first published in 1935. Disney Villain Death: An old Mickey Mouse comic had a giant fall to his death. Dramedy: Charlie Chaplin's The Kid. 1921. Drunken Montage: Hollywood, 1930s or even earlier. Escalator to Heaven: 1941 film Here Comes Mister Jordan, but the parent trope is much older. Foot Popping: Already called for in the Hays Code. Has Two Mommies: Patrick Macnee was raised by his mother and her lesbian lover, who he called his "Uncle" Evelyn. This would have been in the late 1920s. Henshin Hero: The first Captain Marvel, 1940s. Ignore the Disability: 1930s, if not earlier. I Hit You, You Hit the Ground: "There'll be only two blows struck: I'll hit him, and he'll hit the earth. ": Little Nemo in Slumberland, 1909. (if the pilgrims could see what became of American society) "Instead of landing on Plymouth Rock, Plymouth Rock would land on them!" Just Between You and Me: 1940s movie serials, and possibly earlier. Lyrical Dissonance: Puccini's Tosca, 1900, possibly older. Merchandise-Driven: The Little Orphan Annie radio show from The Thirties. Ominous Latin Chanting: Justified [as it's set in a church and involves a villain who's a religious hypocrite] in the Act I finale of Puccini's Tosca, 1900; The modern, more random usages of the trope probably date from Alexander Nevsky, 1938. Private Eye Monologue: Innumerable films noir, 1940s. Putting on the Reich: Alexander Nevsky, 1938 - The Teutonic Knights with swastikas. Ret Canon: Batman from its radio serials in 1944. Stuffed Into the Fridge: Sometime in the early 20th century. Take a Moment to Catch Your Death: Any hard-boiled radio drama. The Day the Music Lied: Popeye cartoon films, 1933-onward. Theme Initials: Superman, starting from the 1940 introduction of Lex Luthor. Theme Music Power-Up: Popeye cartoon films, 1933-onward. The Watson: Nigel Bruce's portrayal of Dr. Watson in the Sherlock Holmes films and radio dramas featuring Basil Rathbone and Bruce as Holmes and Watson. Weird Trade Union: Fritz Leiber's Lankhmar stories, which he began writing in 1939, contain an Assassins' Guild and Thieves' Guild, and so on. The Lankhmar Thieves' Guild was introduced in the second story, "Thieves' House", published in 1943. This page was last edited on 27 October 2018, at 00:05.